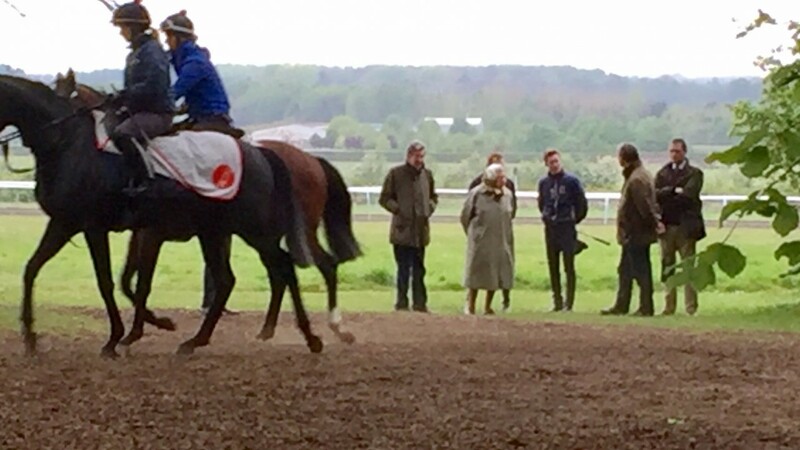 The Queen paid an annual visit on Wednesday to see her Newmarket string, which is split between Haggas, Sir Michael Stoute and Michael Bell. Ryan Moore was first up the Al Bahathri on this recent Newbury maiden winner and had plenty to say to the Queen about the son of Galileo on dismounting. Looked an unlucky loser in the second division of the aforementioned Newbury maiden in the royal colours at Newbury but looked to have learned plenty when impressing in a similar exercise under Pat Cosgrave. Stoute makes things easy for the Queen by equipping her horses with a special red, white and blue cap for her inspection, and she kept a close eye on last year's Royal Ascot winner as he covered a mile in style. Put the finishing touches to her prep for Sunday's Qipco 1,000 Guineas when breezing five and half furlongs under Frankie Dettori at second lot on the Al Bahathri. The Nell Gwyn winner was the focus of much attention, including from her buyer Richard Brown and owner Abdullah Al Naboodah's racing manager Bruce Raymond. The likeable grey would have had a great chance in the All-Weather Sprint Final at Lingfield had a minor injury not prevented his participation and he looked to be nearing his peak when covering five furlongs on the watered gallop under his trainer. The prolific winner is set to return to action in the unique surroundings of Chester next week, close to where part-owner Ron Ford lives. Bell was out early as he had to make time for the visit of the Queen later in the morning and his top stayer got the wake-up call when covering a mile on the watered gallop. Bill Gredley's journeyman did not act on the yielding ground at Meydan on World Cup night and heads for the Group 2 Betway Yorkshire Cup on May 19.